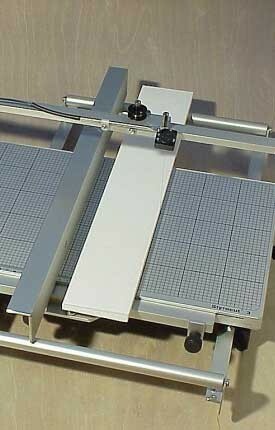 Table Extension by front and back rollers only for STYROCUT-3. Helt by two beams. Ball-bearing rolls are attached in front of and behind the working surface. They work like a table extension enabling a smooth gliding also with larger and longer workpieces. Must always be ordered separately. In the picture you can see Table Extension together with Long Guide Bar.